Story of how Makandure Madush came to Sri Lanka on the sly! 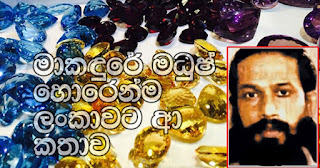 Even when an international blue notice was issued, Makandure Madush, the underground leader who was hiding in Dubai has managed to creep into Sri and had directed gem robberies in Ratnapura and other robberies, a report has been submitted to Polonnaruwa Police Headquarters. Udawalawe, Terrorist Investigation Unit has received a report. A permanent address of this suspect was mentioned as an official residence of Special Task Force, Gonahena, Kadawatha. It was also stated that deserter of Special Task Force, Dilshan Rangana Hathurusingha who was her illicit lover has gone to meet Makandure Madush the moment he has set foot in the island. Rangana is an officer who was expelled from service of the Special Task Force and that when she was at the Sooriyawewa house, Makandure Madush has visited the house several times, it was revealed. She has further exposed that her illicit lover Rangana who rode the motor cycle to shoot and kill a father and daughter near a signal post in Piliyandala an year before and that the shooting was carried out by the underground element called STF Chamara. She also revealed that Makandure Madush who has come to the island, Dilshan Rangana, Chamara with Nalin have got together and carried out the gem robbery in Kuruvita, Ratnapura. During interrogation she revealed that Rangana has vanished all of a sudden after Madush had come and when handbills were printed and distributed saying that anybody who finds him would be rewarded, she had received threatening phone calls not to search for him. Since the suspect was under a warrant, she was produced before Polonnaruwa Magistrate Court under case No. A.R. 195/18, she was remanded. The Intelligence Unit was able to find that Makandure Madush alias Madush Lakshitha who had been served international warrants was unable to be apprehended, he had on several occasions come to India and gone up and down from Sri Lanka via boats. It was revealed that on a previous occasion when he had come to the island Madush had been provided security with Defender vehicles by the son of a strong politician in the South. On a information received to the effect that Makandure Madush was to arrive to be present at a wedding ceremony of an elite family to be held at a luxurious star hotel, though Intelligence operations were launched, it was not possible to get at Madush.